The Monroe Calculating Machine Company was formed as a result of a meeting between Frank Baldwin (the pioneer of the pinwheel mechanism) and businessman Jay R. Monroe in around 1911. Baldwin was an architect by profession, but like many 19th-century men, he was also a prolific inventor who held patents in several unrelated fields. He developed the first pinwheel calculator in 1872-3, and continued to work on a variety of calculator mechanisms throughout his long and productive life. The beginnings of what was later to become the Monroe mechanism can be clearly seen in his US Patent 890888 of 1908, designed when he was already into his seventies. Baldwin died in 1925, just short of his 87th birthday. 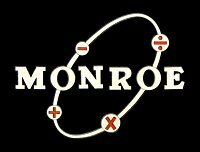 Monroe was a businessman whose interest in mechanics made him well aware of the limitations of the calculating machines of the time. The adding and listing machines used by the banking houses were large and cumbersome, and were generally limited to adding and totalising only. 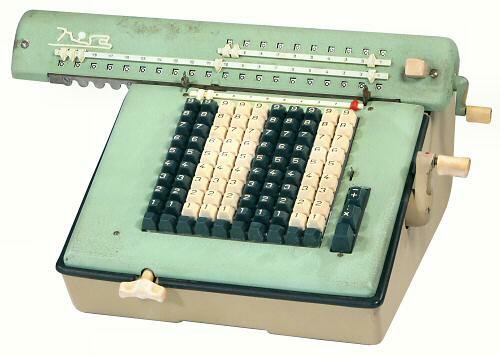 The key-driven Comptometers were capable of very fast and accurate addition and could also do multiplication and division, but they required a skilled operator to get the best results. 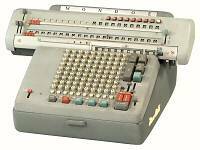 The rotary calculators based on the pin-wheel and stepped-drum mechanisms were relatively straightforward in multiplication and division, but their setting mechanisms (using sliders and rotary dials) were far too slow and error-prone to be useful in adding long columns of numbers. 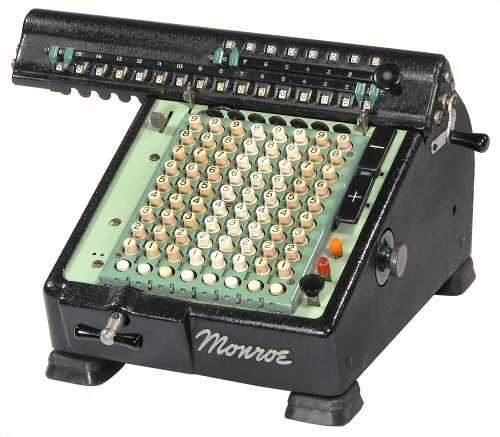 Monroe saw a need for a simple and portable calculator for business applications, which could be used with minimal training, and which would perform all four arithmetic functions with equal ease. 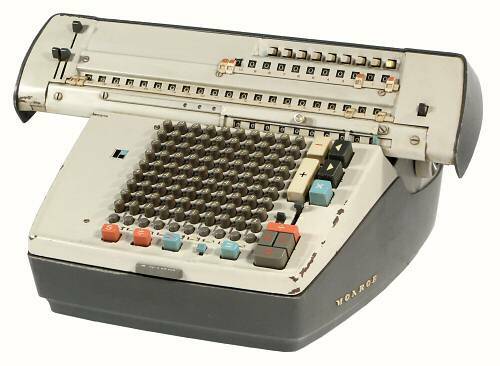 He recognised that Baldwin's latest design had the potential to combine the rapid setting of the key-driven machines with the full arithmetic capabilities of the rotary calculators, and a partnership was formed to develop the machine for production. Monroe himself is said to have played a significant part in the technical development, and his name appears as inventor on several of the subsequent patents. 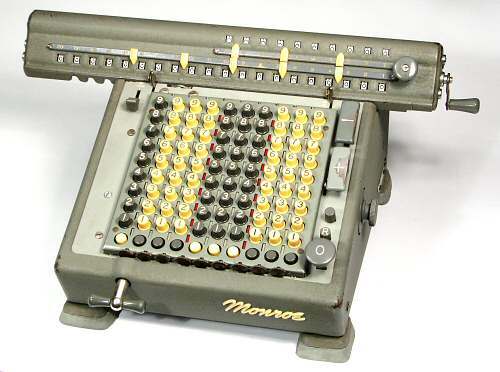 The Monroe Calculating Machine Company was formed in New York in 1912. 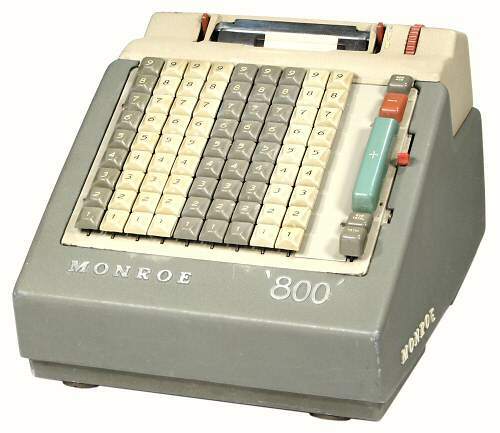 The firm acquired premises in Orange NJ (formerly occupied by the Pike Adding Machine Company), and the first Monroe "High Speed Adding Calculator" entered full-scale production in 1914. Edgar Phinney continued the development of the machine until his departure in about 1920. George Chase joined Monroe in 1917, and soon became Chief Engineer. Chase led the technical development for over thirty years, through models K, L, and M and into the MonroMatic range, and was still active in the company into the 1950s. Herman Gang continued the development through the N series MonroMatics and on into the 1960s. 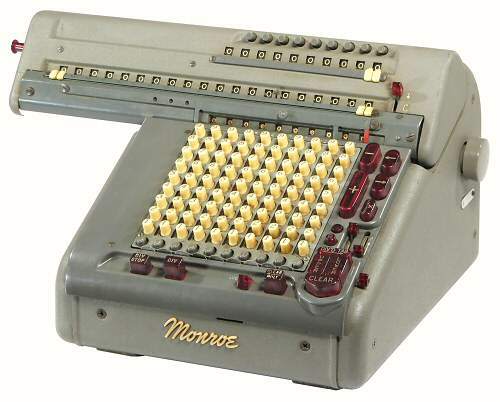 The Monroe product range covered an enormous variety of styles and features, from basic hand-cranked units to high-speed motor-driven machines with multiple registers and fully-automatic multiplication and division. Although still slower than the Comptometer in adding long columns of figures, the machines excelled in any application that required more than just repeated addition. They found a ready home in business and commercial applications, and were the mainstay of many scientific and engineering offices from the 1920s until the early 1970s. 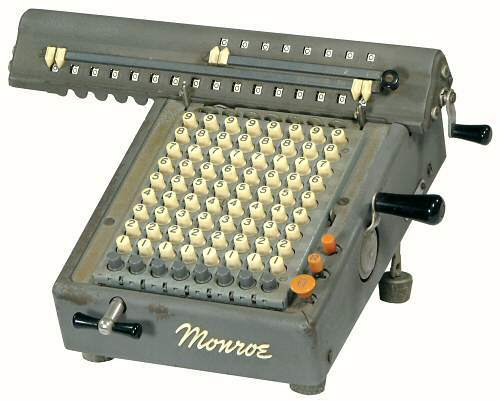 To complement the non-printing rotary calculators, Monroe acquired a range of full-keyboard adding and listing machines from the Gardner company in the early 1930s. The Gardner printing calculators were developed into a successful line of bookkeeping and accounting machines through the 1940s and 50s. Under the post-war European reconstruction plan (the Marshall Plan) Monroe established new factories in Holland and Italy, and re-sold a range of 10-key adding machines built by Olympia in Germany. The Monroe company was acquired by Litton Industries in 1958, and became part of Litton's business systems group. Calculator development and production continued into the 1960s, but by the 1970s the Monroe name was being applied to general office equipment and photocopiers from other sources in the Litton group. The Monroe company has changed hands several times since, but still exists, and is still selling electronic calculators under the Monroe brand. 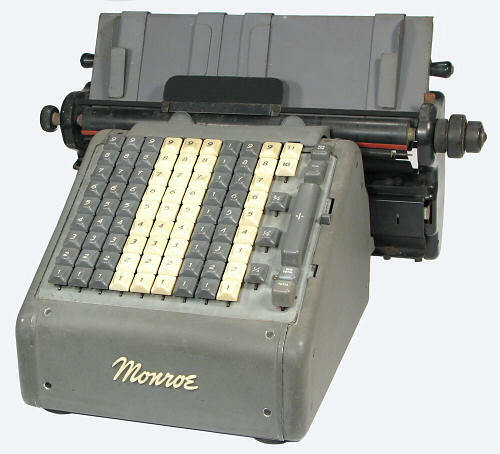 Dimensions: 10-1/2"W x 15"D x 8"H, carriage width 16"
The Monroe Model K calculator followed on from Models A to G in 1921. The Model K has a sloping keyplate with a uniform key height, instead of the stepped keys of the earlier models. The 8-column keyboard is colour coded for decimal currency. Each column has a separate red clearing key (equivalent to a zero key), with a larger master clear button at the right. Two small red buttons on the right set the keyboard to repeat or auto-clear. The carriage is a one-piece aluminium casting which contains the accumulator and counter registers. There is only a single clearing handle, which is rotated clockwise to clear the counter and anti-clockwise for the accumulator. The carriage can be moved one step at a time by half a turn of the T-handle at the front left of the machine, or continuously by lifting the knob at the right-hand end. The front of the carriage rises a little during shift or clearing operations. There is no tens carry on the counter register, and only to two places beyond the keyboard in the accumulator. However, this is sufficient to provide a useful "item count" function when adding a series of numbers. (The counter register is not meaningful beyond 9 items, as it has no carry mechanism). A small knob at the left of the keyboard locks down the "1" key in the leftmost column, allowing up to 999 addition cycles to be counted at the left of the main register (provided that the items being added are less than 7 digits). This machine has a one-piece aluminium surround which is painted in a fine black wrinkle finish. Dimensions: 12"W x 15"D x 8"H, carriage width 16", overall 19"
Model KA from 1922 was the first Monroe calculator with an electric motor drive. The machine has an AC induction motor of about 5" diameter mounted externally on a cast-iron bracket at the left-hand rear. The motor occupies the dead area under the extended carriage, and so requires no additional desk space. The motor rotates in one direction only at 1500RPM. The mechanism is driven through a planetary gearset, with two dog clutches operated by the Add and Subtract bars to select forward or reverse rotation. The case has been widened by an inch and a half to accommodate the control mechanisms on the left-hand side. The winding handle has been replaced with a knurled brass knob, but the crank can easily be re-fitted to operate the machine by hand. The carriage has glass windows above the numerals, but carriage shift and register clearing are still manual. The item count knob is at the lower left of the keyboard, with an additional control lever at the upper left to silence the overflow bell. This KA machine has a four-panel aluminium surround with linoleum linings, and is finished in a high-gloss black enamel. 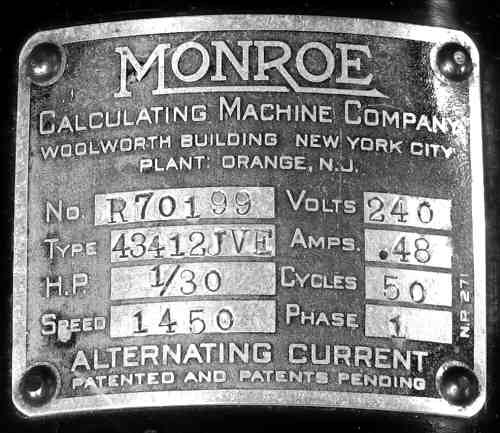 The motor nameplate gives the address of Monroe's head office, which was in New York City until the mid-1920s. A fully-automatic variant (the Model KAA) was built during the mid to late 1920s. The KAA is wider again than the KA, and has a single column of "on-the-fly" multiplier keys to the left of the main keyboard. Monroe Model KAA-203 (Photo contributed by Helmut Siebel). Dimensions: 6"W x 9"D x 3-1/2"H, carriage width 11-1/2"
The Monroe L series was introduced in the late 1920s, and continued on through many revisions until the end of production. The basic mechanism is almost identical to the K series above, but has been "miniaturised" to about one-half of the linear dimensions and one-quarter of the bulk. 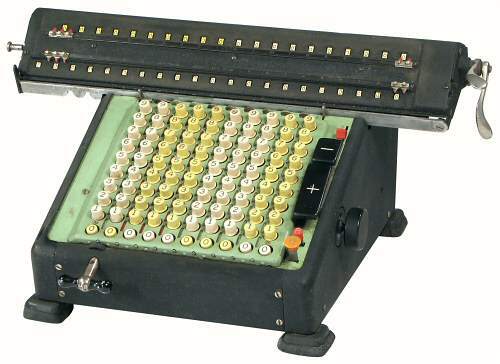 The L-160X is a portable hand-cranked calculator that was first introduced in 1929. The body of the machine is only 3-1/2" high, with a pair of fold-down legs at the rear. The casing, control handles, and folding legs are all of pressed metal. When first introduced, these "Executive" machines were supplied with their own fitted leather briefcase. The example shown is from the late 1940s. The LN-160X is a later version of the L-160X Executive (above), produced in the Monroe factory in Holland in the 1950s. The mechanism is the same as the earlier model, but the styling has been updated to match the other machines in the 1950s "L" and "N" series. The bottom section of the case is made from die-cast aluminium, with streamlined aluminium mouldings for the control handles and the fold-up rear legs. The Monroe name appears on the aluminium trim strip on the top of the carriage, and in individual block letters on the rear of the casing. (This machine has lost the custom rubber mouldings from the ends of the legs). Dimensions: 7"W x 10-1/4"D x 6-1/2"H, carriage width 12"
This Monroe LA5 is a motor-driven machine with automatic division. The model number "LA5-160" indicates an L-series machine, "A" for Automatic (or at least motor-driven), version 5, with a 16-place accumulator. The keyboard and counter register usually have half the number of places. The internal motor drives the addition and subtraction mechanisms in the same manner as in the Model K above. Carriage shifts are performed manually during multiplication, but automatically during division via an internal left-shift mechanism. Division is set up manually, then the lever at the upper left of the keyboard is moved rearwards to begin the subtractions. When a carriage shift is required, the mechanism flicks the carriage shift handle through about 90°, raising the carriage and moving it half a place to the left. It relies on momentum and gravity to complete the movement before the actuator drive re-engages. Register clearing must still be performed manually. 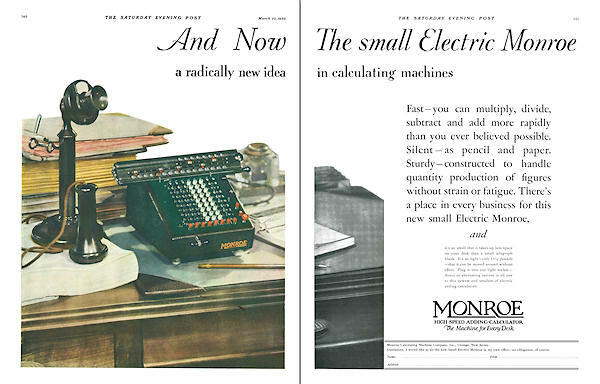 Double-page advertisement introducing the new "Small Electric" Monroe, Model LA, March 1930. Dimensions: 7-3/4"W x 10-1/4"D x 6-1/2"H, carriage width 12"
This LA5-200 is a later ten-column machine with a revised colour scheme and a few minor changes, but is otherwise identical to the previous model. The colour grouping of the keytops suggests that this machine may have been used for technical rather than commercial calculations. Dimensions: 8-1/2"W x 10-1/2"D x 6-1/2"H, carriage width 13"
The LA7 has a larger and more streamlined case painted in two-tone grey. The casing can be easily removed without needing to remove the carriage or the shift handle. The carriage is an inch wider than in previous models due to the die-cast end covers which hide the previously-exposed shaft bearings. The internal mechanism is basically unchanged from the earlier models. The LA9 from 1960 has replaced the rotary carriage shift handle at the front of the machine with a lever at the right of the keyboard, so as to allow rapid one-handed operation during multiplication. The "3" added to the model number indicates a machine with a tens-carry mechanism on the counter register, which enables the operator to do "short-cut" multiplication. However, the counter can not be reversed during division and thus shows the complement of the result. A second counter with the usual red figures is provided at the upper left of the carriage to display the true result. Clearing the registers is still done manually, with both counters cleared together. Dimensions: 9-1/2"W x 12"D x 8"H, carriage width 15"
The Monroe "M" series machines were built during the 1930s and 40s, replacing the Model K and providing a heavy-duty alternative to the L series. The keyboard, actuating, and carry mechanisms are the same in principle as all the previous models, but the control mechanisms have been redesigned to allow more automatic and power-assisted operations. Model MA3 is a basic machine in which the motor only drives the addition mechanism. Carriage shifts, register clearing, and sequencing of multiplication and division are all performed manually. The carriage has two counter registers, with tens-carry on the main (right-hand) register. The main counter can be reversed by the red lever behind the Minus key. The previous two-way crank for clearing the registers has been replaced with two separate levers, and a control to enable the counters to be cleared independently. 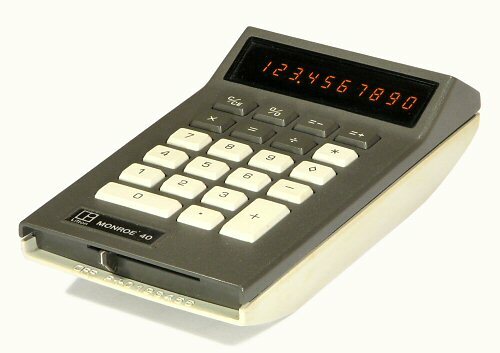 This early MA3 still carries the "High Speed Adding Calculator" label on the back panel. Dimensions: 11-1/2"W x 13-1/2"D x 8-1/2"H, carriage width 15"
This Monroe MA7 from the late 1930s is a semi-automatic machine which includes motorised controls for carriage shifts and register clearing. 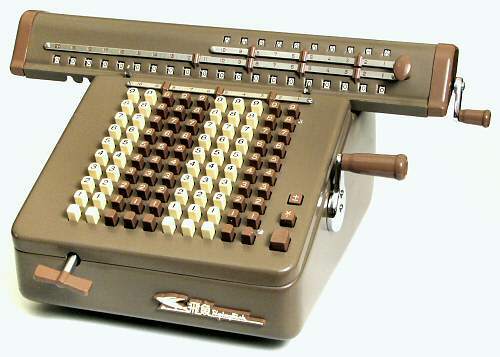 The machine has automatic division and dual counter registers as described above, but multiplication is still performed manually. 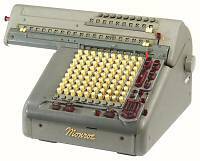 Dimensions: 9"W x 11"D x 8"H, carriage width 13"
The MonroMatic CSA-10 from the 1940s is a very fast fully-automatic desk calculator in a very compact package. 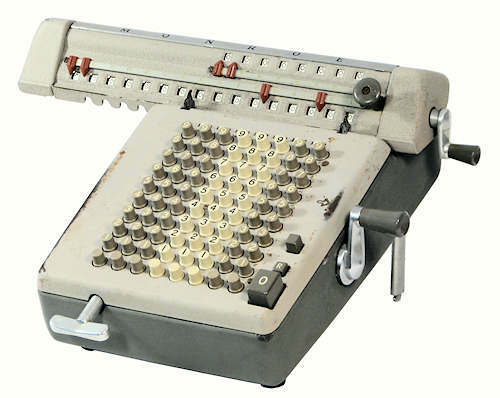 To perform a division, the operator first selects the number of digits required in the result by pressing a button on the carriage tabulator, then enters the dividend on the keyboard. Pressing the "Div Tab" key positions the carriage, enters the dividend, and clears the counter register. The operator then enters the divisor and presses "Div", and the calculation proceeds automatically to completion. To perform a multiplication, the operator enters the first factor and presses "Enter X". This positions the carriage to the left and transfers the number to the small multiplier register just below the main result register. On entering the second factor and pressing "Mult", the machine clears the result and counter registers, automatically performs the necessary adds and shifts, and returns the carriage to the left on completion. An "Acc" control allows the results of successive multiplications to be accumulated. Dimensions: 10"W x 14"D x 8"H, carriage width 14-1/2"
The Monroe N series was introduced in the 1950s. This fully-automatic Model 6N is generally similar to the CSA-10 above, but in a re-styled and somewhat larger one-piece case. The keys involved in multiplication are coloured green, and those for division red. All of the keys are also labelled in plain words. 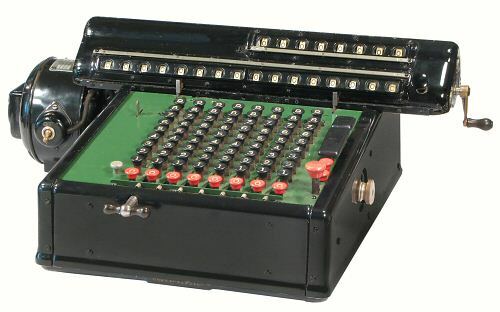 Model 8N-213 from the mid-1950s has an additional 10-digit counter register (without carry) at the top left of the carriage. The main accumulator has an extended tens-carry mechanism mounted under the carriage on the left-hand side. The keyboard has a Dividend Align tab on the left, and a Neg Mult button at the front. Technology: Stepped drum, fully automatic. Dimensions: 10"W x 14"D x 9"H, carriage width 14-1/2"
Manufactured: Orange, New Jersey, 1950s. MonroMatic Model 88N adds a second 20-place accumulator register which can be engaged and cleared independently. 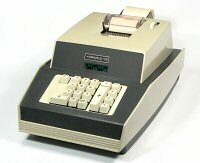 The small 4-digit counter on the left of the machine records the number of multiplications performed, which is useful in certain statistical calculations. Dimensions: 10-1/2"W x 14"D x 8-1/2"H, carriage width 15-1/2"
Manufactured: Orange, New Jersey, 1960s. Model 6F is a late-model MonroMatic from the mid-1960s in a re-styled die-cast housing. The Monroe banner on the carriage has been replaced with a small Litton Industries logo on the front panel. The last patent listed on this machine is for the design of the external casing, awarded to Terry L Barner of Monroe in March 1962. The manufacturer is given as the Monroe International Corporation of New Jersey. A label on the back of this machine shows that it was still under a maintenance contract with the local agents until June 1977. 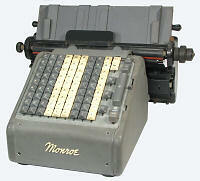 The Monroe full-keyboard adding machine is based on a mechanism developed and sold by Clyde Gardner in the 1920s. Gardner had worked for William Pike's adding machine company in Orange, New Jersey, in the early 1900s. He held a number of patents for the Pike machine, and continued its development at Burroughs after Pike's company was acquired in 1909. In the early 1920s Gardner established his own calculator company in Pennsylvania. His design was based on an unusual "crawl-carry" register, as outlined in his US Patent 1828180 filed in 1924. The machines were sold commercially from 1926. After Gardner's death in around 1930, his company was acquired by Monroe (who, as fate would have it, were now based in the old Pike factory in New Jersey). 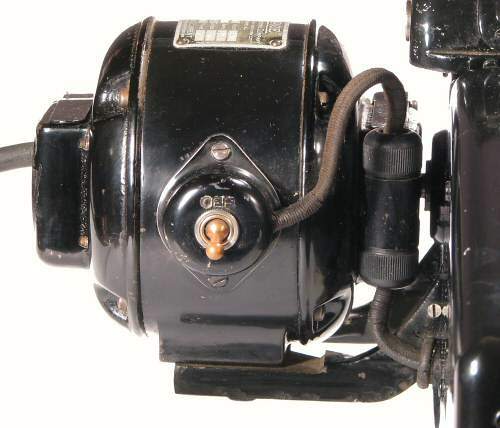 Loring P Crosman of Monroe continued the development of the Gardner machine through the 1930s and 40s, with a string of about thirty patents variously assigned to the Monroe and Gardner companies. Crosman first appeared in the patent record as designer of the clearing mechanism for the Monroe M series (above). He is last found in the late 1940s working on valve-powered electronic calculators at Remington-Rand. Dimensions: Body 10-1/4"W x 11-1/2"D x 9"H, carriage width 15"
The Monroe Model 410 is a full-keyboard motor-driven adding and listing machine for Sterling currency (including farthings). There are five function keys for add, subtract, total, sub-total, and non-add, and two small levers at the right for keyboard repeat and clear. The basic machine could be fitted with a variety of paper handling mechanisms. The machine illustrated has a wide travelling carriage which accomodates either paper rolls or pre-printed forms. The carriage has settable tab stops, but has to be positioned manually. 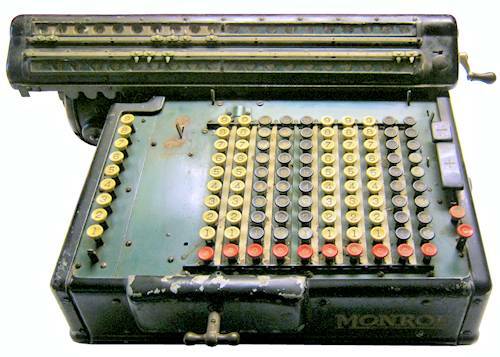 Machines with more elaborate options (such as multiple accumulators and powered carriage positioning) formed the basis of a range of Monroe bookkeeping and accounting machines. 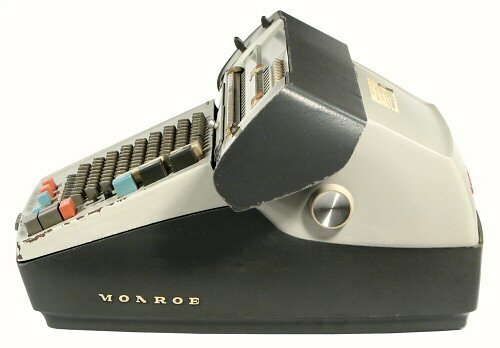 This Monroe 800 is a later version of the Model 410 above. The pressed-metal casing has been replaced with a one-piece surround in cast aluminium, styled to match the contemporary N series machines. This 10-column machine was built for Sterling currency in the late 1950s. It has been converted to decimal currency, with a cover plate fitted over the rightmost column. The machine has a fixed printing mechanism for roll paper only. In spite of its ponderous bulk, this machine does no more than a basic office add-lister. In the 1950s Monroe commenced development of a ten-key calculating machine to fill an obvious gap in their product range. In the meantime, they re-sold this basic ten-key add-list machine sourced from Olympia in Germany. 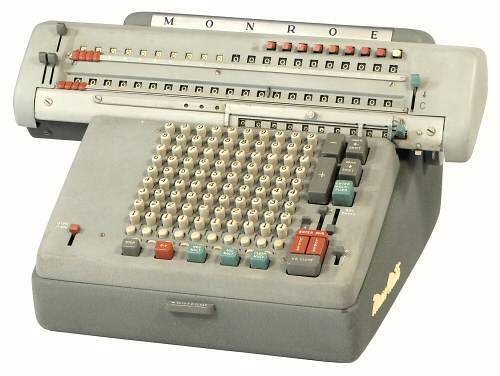 This Monroe ten-key calculator is based on the Ultra 804, developed by Oerlikon-Bührle in Zurich in the late 1950s. Oerlikon was originally a machine-tool manufacturer which branched out into armaments and munitions, and took up calculators as a civilian enterprise after the 1939-45 war. 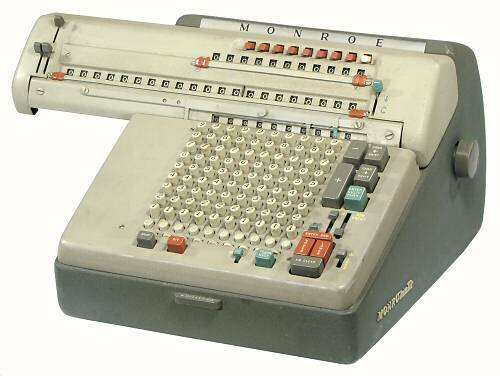 The firm later returned to military work, and sold its final calculator design to Monroe. The mechanism was designed by Gustav Schenk of Oerlikon, and is described in his US Patent 3082942 (filed in 1961). The patent is assigned to the Litton World Trade Corporation of Panama City. Schenk continued to develop the machine for Monroe during the 1960s. Patent D189942 attributes the casing design to Richard Hollerith Jr (Director of Design at Monroe), with assistance from Richard Dorner and Terry Barner. The machine combines the total and sub-total functions of the printing calculators with the fully-automatic multiplication, division and back-transfer of the top-end rotary machines. The keyboard controls are clear and simple, and the machine operates quickly and quietly. The mechanism uses a combination of pin-carriage and racks for the entry and printing functions, with an actuator and carry mechanism based on a miniature version of the Odhner-style pinwheel. The machine was manufactured in Monroe's European factory in Amsterdam. 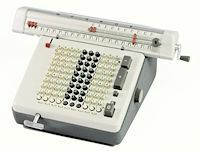 As Monroe became more fully absorbed into the Litton "Business Systems" group during the 1960s, its name was applied to a range of products that had little or no connection with the original calculator company from New Jersey. 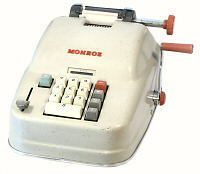 This very late ten-key add-list machine is branded "Monroe", but was built in the UK by some other (unidentified) part of the multi-national Litton group. Dimensions: 85W x 150D x 45H, weight 365g. Monroe's first electronic calculators were re-badged desktop machines built by Canon in Japan and Compucorp in the USA. This portable Model 40 from 1974 appears to have been designed by Monroe themselves. 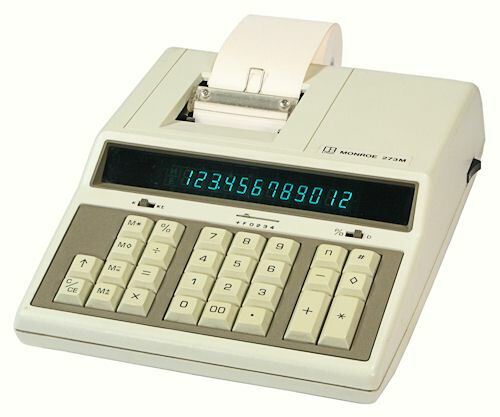 The calculator operates in the traditional adding-machine fashion for addition and subtraction, with separate Total and Sub-total keys. The display shows the last value entered, rather than the running total. Multiplication and division operate algebraically, with a common Equals key and an independent result register. Separate +/= and -/= keys are provided to add the results of multiplications or divisions into the addition register. This arrangement has the peculiar effect that a multiplication or division can be carried out in the middle of a string of additions without upsetting the accumulated total. 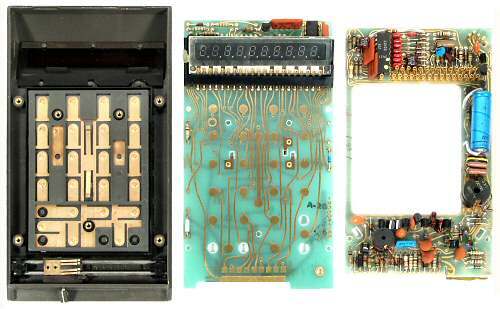 The calculator uses a General Instruments 175A processor and a Burroughs Panaplex II gas-discharge display, and draws about 900mW from 4 disposable AA batteries or a rechargeable NiCad pack. The sliding power switch at the front of the machine also serves as the decimal selector, with a choice of 0 to 6 fixed places, adding machine mode, or full floating point operation. The distinctive case for the Model 40 was designed by Myron Beitler and Douglas Graham of Monroe/Litton in 1973 (US design patent D236483). Dimensions: 297W x 295D x 80H, weight 2.25kg. 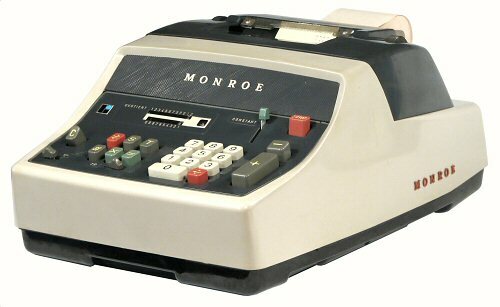 The Monroe 273 from 1979 is a 12-digit office adding machine with a large fluorescent display and an internal Epson printer. This electronic calculator operates in the traditional adding-machine fashion for addition and subtraction. The display shows the running total after each operation, so the Total and Sub-total keys are only used when keeping a printed record. The number of items added is counted automatically and printed along with the total, but it can also be retrieved with the "n" key and used in a further calculation. 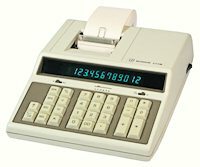 Another adding-machine feature is the "#" or "Non-Add" key, which is used to enter and print a reference number without adding it into the total. The calculator has a single memory register which is accessed through a second set of +, -, total, and sub-total keys at the left of the keyboard. Multiplication, division, and pecentage calculations operate algebraically, with a common Equals key and an independent result register. Results can be added to the addition register, or they can be accumulated automatically in the memory register by setting the leftmost switch to the "Σ" (Sigma) position. 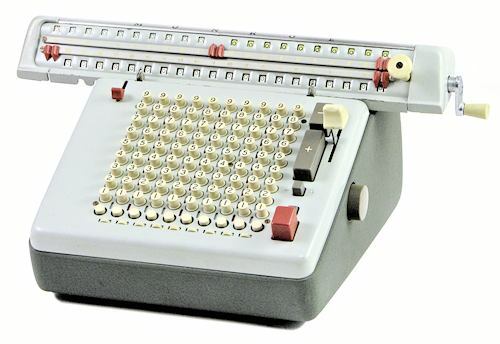 The central switch selects "adding machine" entry, 0, 2, 3, or 4 decimal places, or floating point mode. The right-hand switch controls the printer. 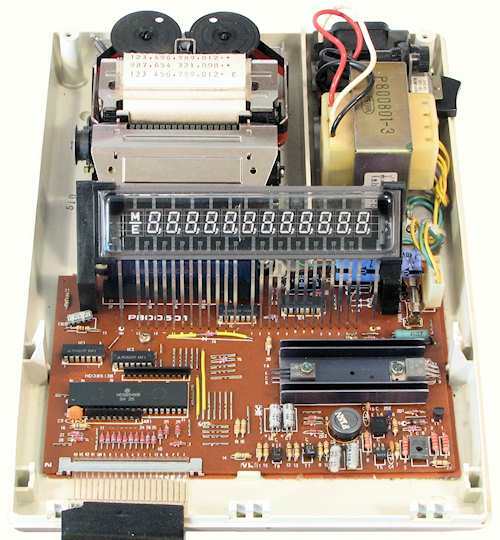 The calculator uses a Hitachi HD38546B processor in a 42-pin x 0.6" DIL package, although the board overlay is marked for a HD38513B. There are four support chips to drive the display and printer. The Futaba fluorescent display module has large 9.5mm digits on 8mm centres, with polarity, memory, and error indicators at the left-hand end. The Epson Model 350 impact printer has 16 columns of numerals, with two columns of symbols on the right-hand side. Decimal points and thousands separators can be printed in any position, and occupy a full column each. Subtractions and negative totals are printed in red. The calculator has an IEC power input socket at the rear, an internal 110/220V selector switch, and an internal insulated mains fuse holder. Dimensions: 7-1/2"W x 10"D x 7"H, carriage width 13"
This "Flying Fish" Model JSY-20 was built in China in the 1950s by the Shanghai Calculator and Typewriter Manufacturing Works. 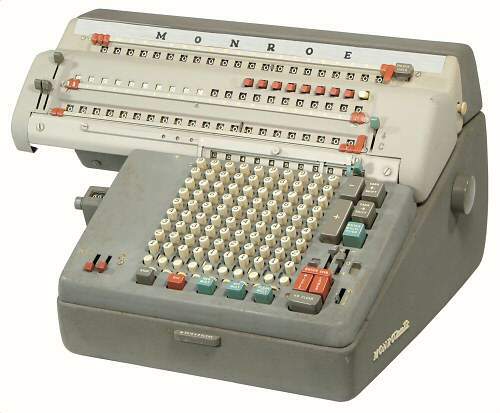 The machine bears more than a passing resemblance the Monroe L-series calculators of the time. The Flying Fish instruction manual is likewise "adapted" from the Monroe documentation. Dimensions: 9"W x 11-1/2"D x 7"H, carriage width 13"
This hand-cranked Nisa Model K1 is a clone of the Monroe LN-200. The underside of the plastic casing has additional cutouts to suit a motorised version, including a 110/220V selector switch. 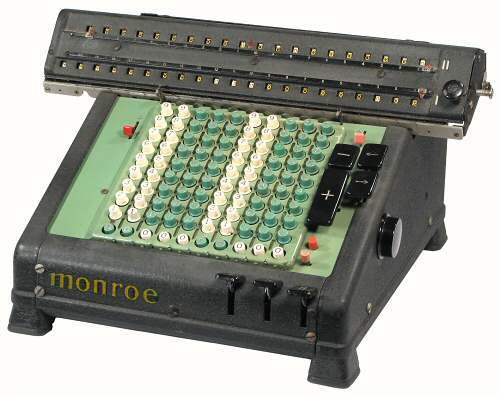 The Monroe High-Speed Adding Calculator label from the 1920s and 30s. The Monroe script badge used during the 1940s. The Monroe rear-panel badge from the 1950s and 60s, inspired by the atomic age. An N-series Monromatic badge, used on the sides of the machines. A nameplate attached by Business Equipment and Engineering Pty Ltd, who were Monroe's Australian distributors in the 1940s. The Technical Section of this site has several reproduction Monroe manuals and an illustrated technical description of the Monroe-Baldwin mechanism. The current descendants of the Monroe company have a web site which provides information on their early history. The material includes articles and personal recollections by Frank Baldwin and Jay R Monroe. George Chase's 1952 lecture to the Association for Computing Machinery gives an insight into this remarkable engineer who led the development of the Monroe range for over thirty years. The lecture and illustrations were printed in the Proceedings of the ACM in 1952, and reprinted in the IEEE Annals of the History of Computing in July 1980. Copies of these journals are available in some academic libraries.